Today's the deadline for the latest Modern Quilt Guild challenge, and I got my quilt finished and posted in the MQG forums early this afternoon. I had a hard time getting the colors to show up right in my photos, so I'm including pictures taken both outside and inside. 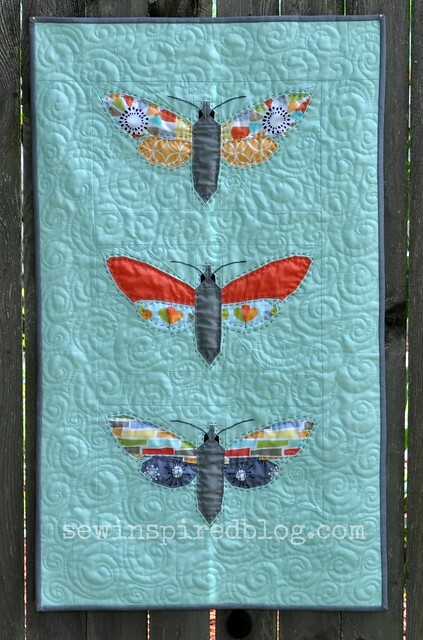 I made three paper pieced moths using the challenge fabric for the wings and a gray solid for the bodies. I designed the moth pattern, just to see if I could, inspired by an old scientific insect drawing that a friend pinned on Pinterest. This blog post on Shape Moth was very helpful for figuring out how to draw the pattern in EQ7. Sewing the moth blocks was pretty labor intensive, but by the last one I had figured out some tricks to speed things up and make sure everything fit together correctly. The antennae were embroidered with embroidery floss in a basic chain stitch. 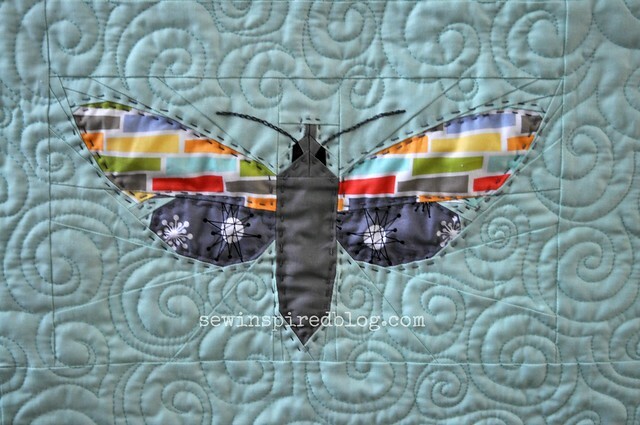 I decided to hand quilt the moths with perle cotton, and then machine quilted the background. I got about 6 pokes that drew blood while hand quilting over the last couple days, but didn't get any on the quilt! This quilt was kind of an exercise in using what I had on hand. I had thought about buying a light gray fabric for the background, but still had a large chunk of the aqua solid (Kona ice frappe), so I decided to use it even though I've used that same fabric in my last three mini quilts. Same with the quilting thread--ideally I would have used a slightly lighter aqua thread for the machine quilting, but I used what I already had and I think it turned out fine. I'm really glad I was able to participate in this challenge. 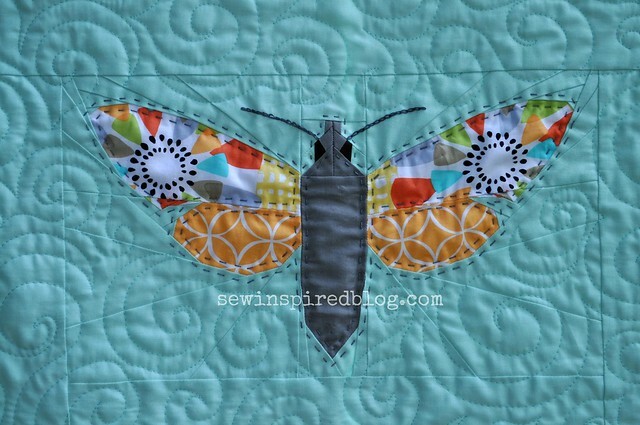 I learned a lot and might even try making more paper pieced insects someday. Thanks a bunch to the Modern Quilt Guild and Michael Miller for providing the challenge fabrics! I love it! 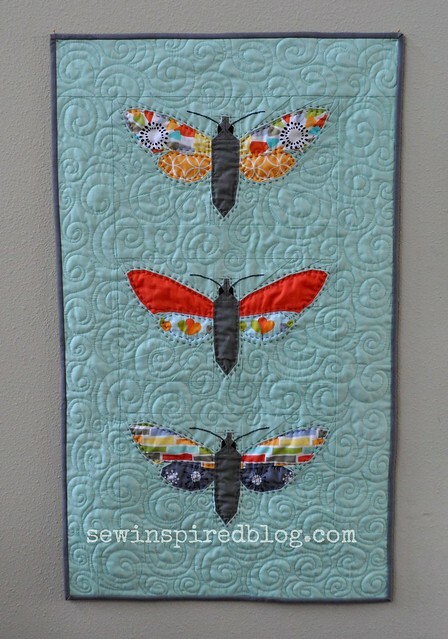 All of the colors, the background stitching and especially the intricacies of the bugs. Such nice work Vicki. (Miss you)! You are amazing. You can even tempt people to want to have moths in their home. BEAUTIFUL If you sell your pattern I would love to buy one. I love your entymology entry. 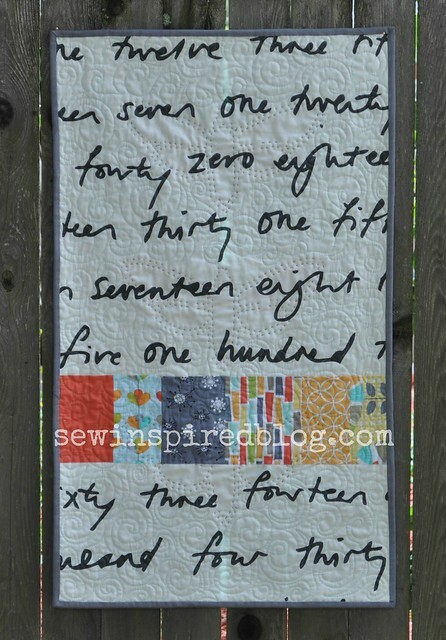 Your paper-piecing is super and the colors you used rock! Beautifully done. I love the hand stitching too.